Ambalapuzha Sri Krishna Temple is a temple in Ambalapuzha in Alapuzha district. This temple was constructed in the year 790 by Chembakasserry Pooradam Thirunal Devanarayanan Thampuran. It is associated to the Sri Krishna temple in Guruvayoor. The idol from Guruvayoor temple was bought and kept in this temple by Tipu Sulthan in the year 1789. 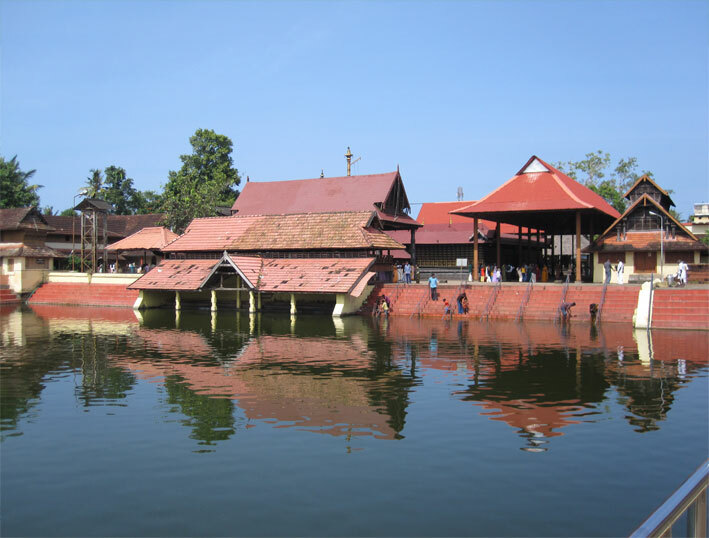 The architecture of this temple is very famous and is believed to be one of the seven greatest Vaishnava temples in the Travancore. The inner walls of the Chuttambalam of the temple are decorated with various paintings. The art for Ottanthullal was first performed from this temple premise. The poojas in this temple is performed by the Namboothiri Brahmins belonging to the Puthumana Thanthri family. Many stories and myths are related to the origin of this temple. One of the stories is that earlier Ambalapuzha was under water. The ruler of this place and Vilwamangalam Swami were taking a water cruise and they happened to hear a flute sound from a nearby tree. They reached the shore and searched for the music. Swamiyar saw Lord Krishna sitting on a tree and playing his flute. Both Swamiyar and the King prayed the Lord and sang hymns. The presence of Lord was considered as a blessing and Vilwamangalam asked the King to construct a temple for the Lord in place where they saw the God. The temple was constructed there and an idol was also made. But the high priest refused to keep that idol and later another idol was bought and fixed in place. This function was carried out on the Moolam star day. In remembrance of this day yearly celebrations are made by conducting a snake boat race. It is very famous and is popularly called as the Champakulam boat race. Ambalapuzha payasam which is a sweet pudding prepared from rice and milk is very famous. It is an offering to the deity and is given to the devotees. A myth is also related to this payasam. The legend says that once Lord Krishna appeared as a sage in front of the ruler of that area and challenged him to play chess. The King was a Chess enthusiast and so accepted the challenge. The prize for the game was to be decided before the game. The sage was asked to choose his prize. The sage said that he would like to have a few grains of rice. The amount of rice was determined in such a manner that one rice grain shall be kept on one square of the chess board. Two grains on the second, 4 grains on the third, 8 grains on the fourth square and so on. The King was unhappy with the demand as he expected to gift the sage with valuables to which the sage declined. Unfortunately the King was defeated in the game and so decided to pay the prize to the sage. The King soon realized that with each square the amount of grain is increasing in geometric progression. The amount of rice needed to fill all the 64 squares in the chess board is equal to trillions of tons of rice. The King could definitely not pay the prize to the sage at the time. So Lord Krishna appeared in his original form and asked the King that he need not pay the rice all at once. So the King was to serve payasam that is made of rice to the pilgrims free of cost to pay the debt. Similarly there are many other stories that are connected with this offering. The festival in this temple is conducted yearly in the Malayalam month Meenam which comes in the months March/ April. It is a 10 days long festival and feast will be conducted in the temple hall. Some other festivals in the temple are the 12 day long Kalabham festival during the Malayalam month Makaram which comes in the months January/February and ‘Pallipana’ is performed which is done once in twelve years.